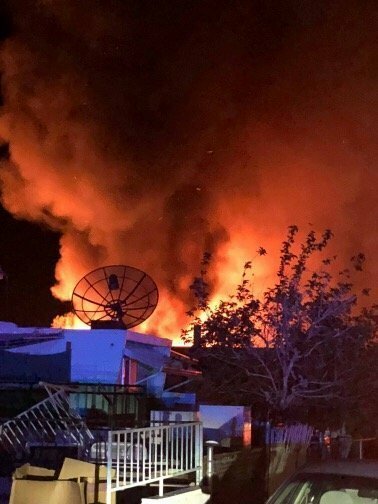 FORT MOHAVE—An explosion rocked a Fort Mohave neighborhood tonight and four homes reportedly went up in flames. The fire occurred in the 4500 block of Calle Valle Vista and Calle Esperanza. The cause of the massive fire is still under investigation with fire officials. One neighbor told The Bee he heard the explosion, ran outside and saw the inferno. There have been reports of fatalities, however, The Bee has not confirmed with fire officials. Scanner traffic indicated a request for the medical examiner to respond. Multiple fire agencies assisted with the fire. Mohave Electric Cooperative responded to the scene a short time later. A transformer exploded knocking out power and internet services to surrounding neighbors. Stay with The Bee for developments on this story. So sweet. MCSO gave little girl who appeared at scene crying with her mother a little stuffed bear to comfort her. They didnt know if their home was one that was burning from explosion. Officer walked to his car got the stuffed toy for her. I enjoy the local news from the Bee! I heard that it was a meth lab is that true.